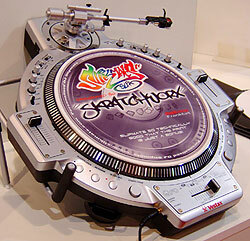 At the annual PLASA show back in 2003, Vestax let the world lay eyes on their latest concept. 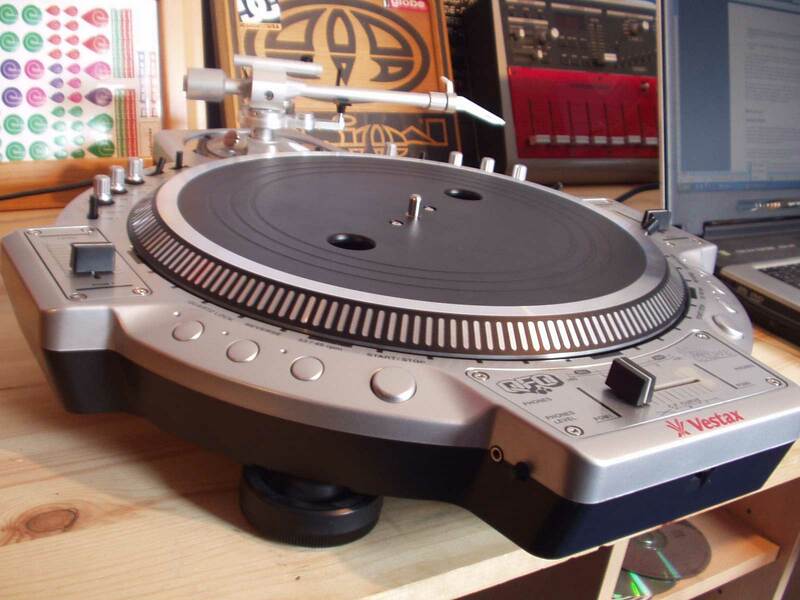 Developed in conjunction with Thud Rumble’s Q-Bert and Yogafrog, it was something that had never been tried before, a hybrid turntable/mixer dubbed the QFO. Utilising technology from the PDX-2000 and PMC-05pro MkII, Vestax had created an all in one “portable” skratch unit, a unit dedicated to the Turntablist and the art of Turntablism. Since then a year has passed and their turntable line up has been updated, with 2 additional models being released. Keeping in line with this the QFO underwent a revamp before it itself was released. Graced with the new Dynamic Balance Straight Arm, a new lower platter, PMC 05Pro MkIII Circuitry and a cleaner, curvier body. This is the unit that’s been publicly available since Sept 2004. 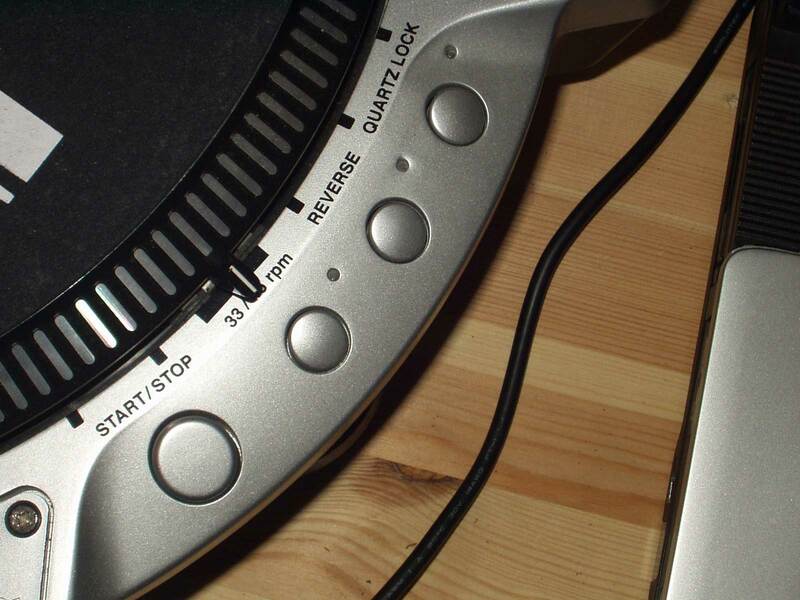 General Features: Between the X-fader and the line faders are your start/stop, 33/45rpm, reverse (which is very powerful) and quartz lock buttons, a set on each side. They are slightly domed as on the PDX’s. Start and stop speeds are not adjustable which personally is quite annoying as it stops on a 5 pence piece, in-fact it can respond quicker than it can be physically pressed. 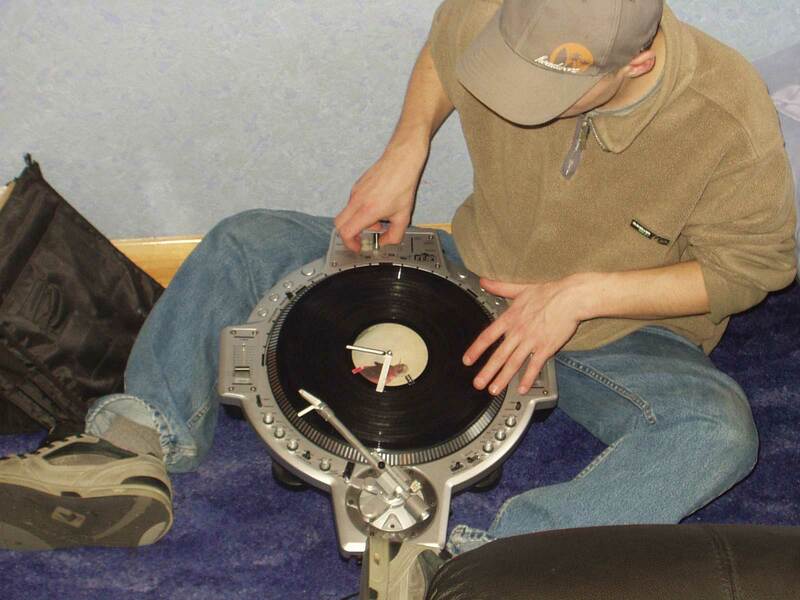 I prefer just a little bit of lag myself but it does show just how far turntable technology has progressed. The unit starts up on 33rpm with its appropriate red led on. Reverse is off as is quartz lock. Tonearm: Along with the “Pro Edition” turntables this unit boasts the best tonearm in the industry “The Dynamic Balance Straight Arm”. Without the rocket science this basically means that the needle is held in the grove by the pressure of a spring rather than using gravity, like everyone else’s turntables do. By utilising the power balance of a spring stability increases as does the trace ability resulting in minimum skipping during heavy scratching. It’s so good in fact that I’ve been running a M44-7 at 2.5grams with no skipping - even though I do get a little heavy handed at times. Being an A.S.T.S. tonearm there’s no anti-skate and setup is fairly easy. The counter weight is reassuringly sensitive, much more than on the standard arm, and is machined from solid metal - not a large tube with a weight glued inside like on previous models. For a 44-7 I’ve found that if you line up the end of the weight and the tonearm together and set the styli pressure to 3 that gives excellent trace without overdoing it. 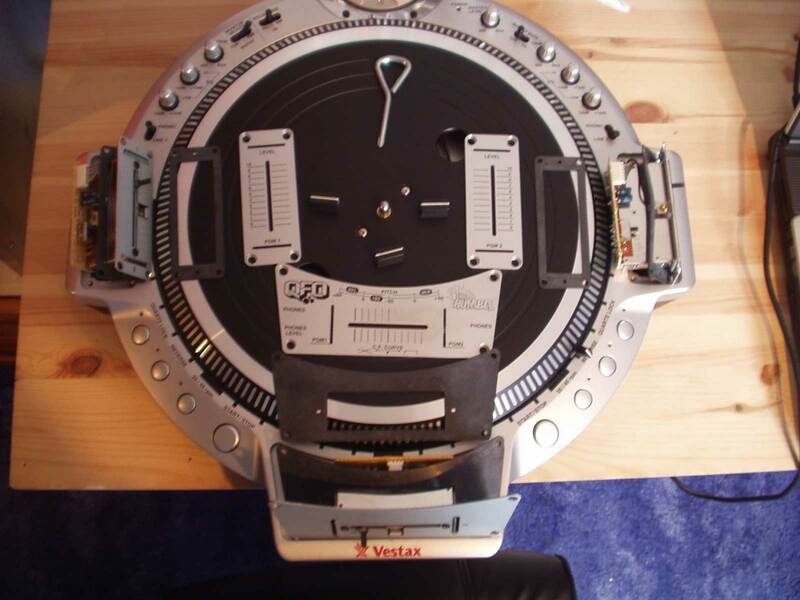 I should note however that I have, until recently, been using a Stanton Headshell due to the thickness of the Vestax Headshell restricting me from using a 44-7 with the bolts provided. 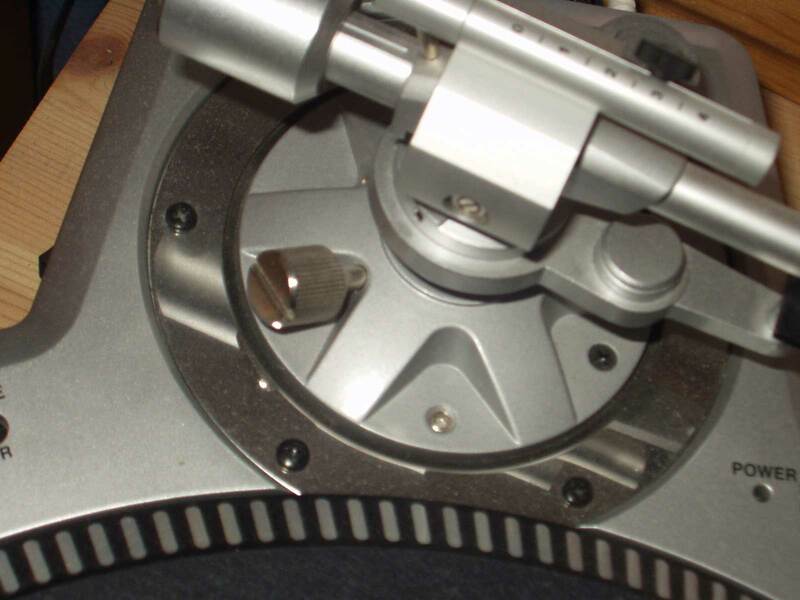 The tonearm can be used on the right side of the platter (record travels away from stylus tip) or on the left (record travels towards stylus tip). 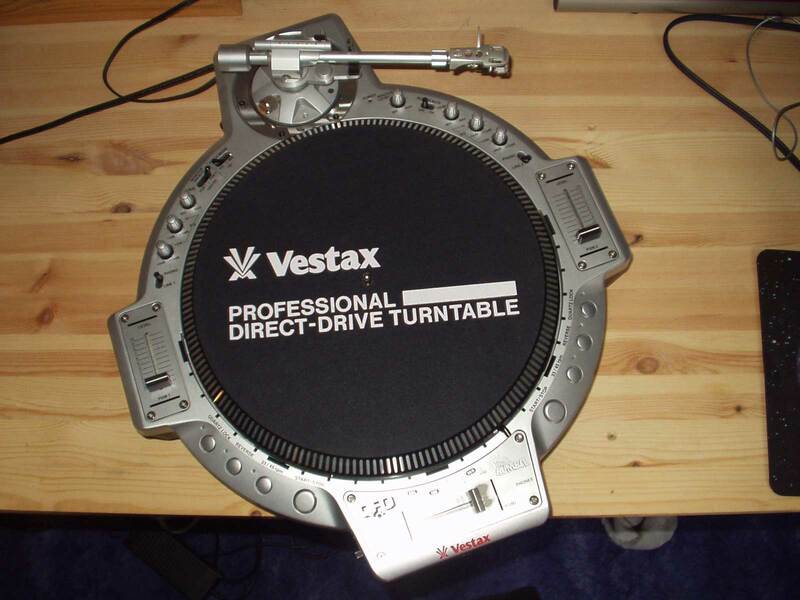 A feature only found on Vestax’s Pro range turntables. 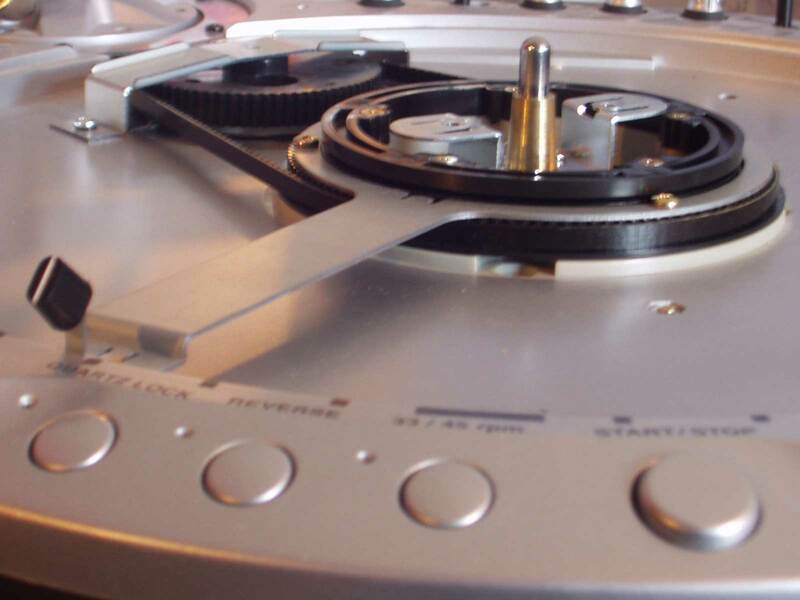 Motor and Platter: At the heart of the instrument is Vestax’s tried and tested PDX-2000 motor rated at 2.7kg/cm. Although the motor hasn’t changed (apart from being lowered) the platter has been completely redesigned. The smooth flowing lines are gone and have been replaced by a lower (7mm to be exact), sharper, slippier platter complimented by straight polished lines on a matt black finish. 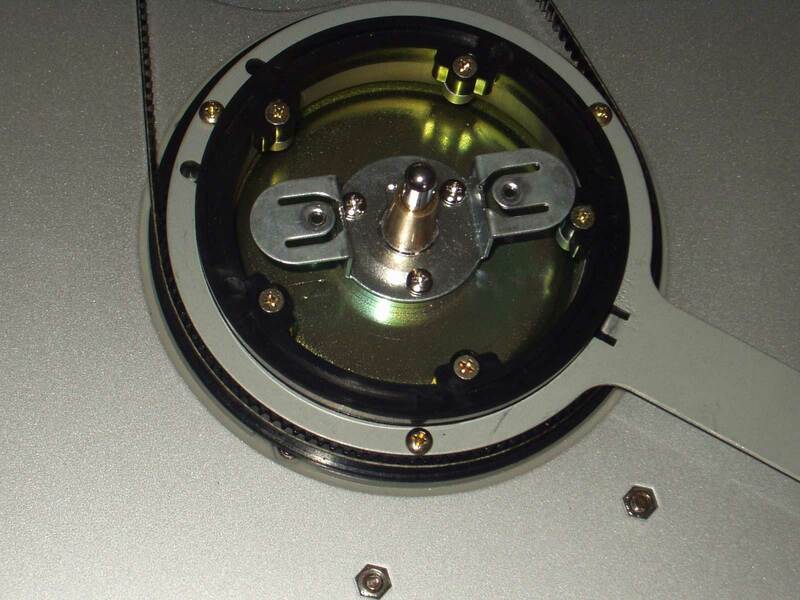 Looking at the top of the platter; there are now only two holes for you to remove the platter by, it’s screwed down to the motor as before, sports three indented rings and a polished outer edge. Overall feel is like nothing else on the market and will take time getting use to for some. The finish is of very high standard and it has kept its shine over time. Pitch Control: Total pitch adjustment is +/-60% adjustable by the world’s 1st 180° slider with 3 settings 90° left - 9 o’clock being +60% and 6 o’clock being -60%. Adjustable +60% to -60% counter-clockwise. Between 6 and 3 o’clock is fixed at -60% and unchanged. 90° right - 3 o’clock being +60% and 6 o’clock being -60%. Adjustable +60% to -60% clockwise. Between 6 and 9 o’clock is fixed at -60% and unchanged. 180° – 3 o’clock being +60%, 6 o’clock being -60% and 9 o’clock being +60%. The overall feel of the slider is just right, not too tight without being silly loose. 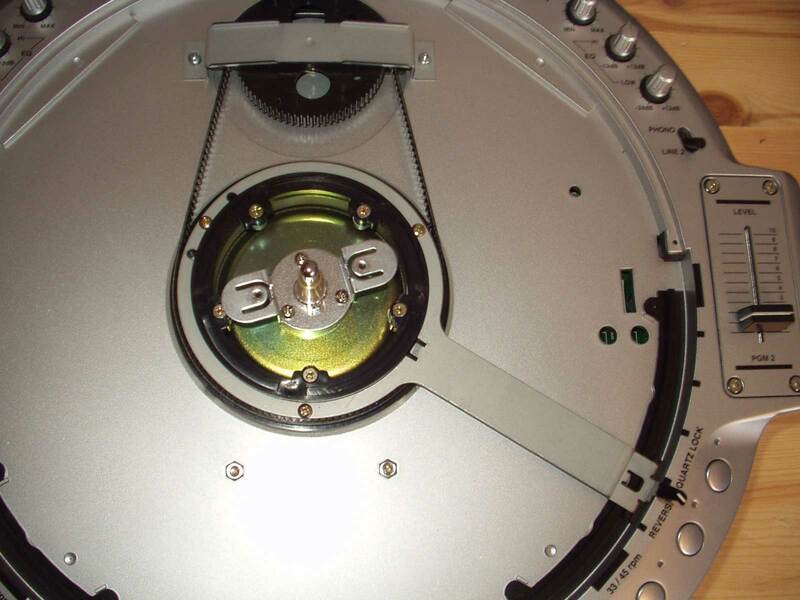 There is a little play upwards and down but it doesn’t catch on the platter or the main body of the unit. Markings are every ten percent and are the right sort of size. However the marking for zero is very thick making it fairly difficult to achieve at speed. The new platter markings really come into play here though because they are very prominent making matching zero incredibly easy. This does however only works at 33rpm. The slider is quite a device in it’s self. 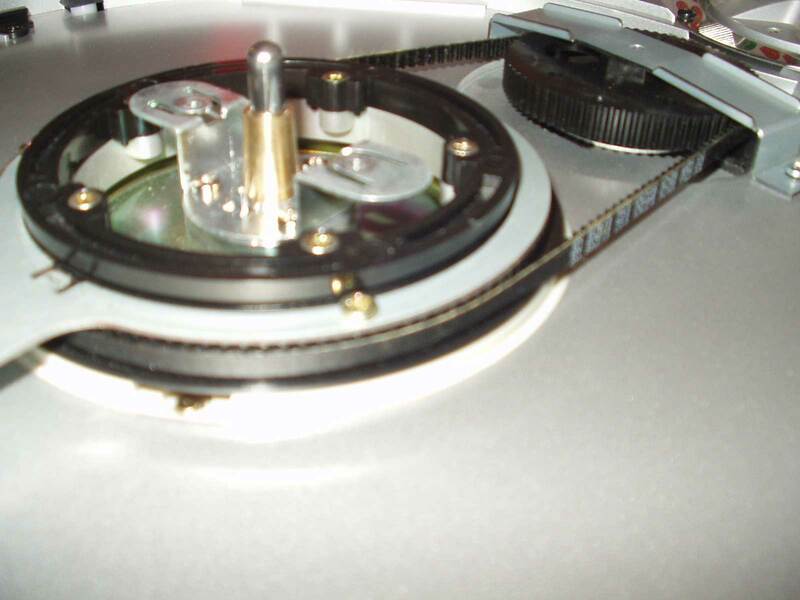 The slider stem is part of a 1 piece metal fabrication (as shown) which is screwed to a free floating cog surrounding the motor. This is connected to another cog via a belt (yes a belt) which controls the pitch. I should point out that the belt is very heavy duty for such a light task and I have no questions as to its longativity or reliability. General Features: Around the X-fader area you’ll find the headphones sockets, a 6.35mm jack socket on the right and a 3.5mm jack socket on the left. Also on the left is the headphone volume control which is extremely loud. Up near the base of the tonearm on the left we have the monitor select which can be set to PGM1, PGM2 or the master via a 3 way toggle switch. On the opposite side we have the master level control and a master mute switch which is the same type as the phono/line switches. This is too close to the trim for PGM2 and I hit my thumb on it every time I use it. The phono/line switches are located between the EQ and the line faders. They are plastic which was a shock since the rest of the mixer technology is 05pro Mk3 which is equipped with the metal variety. You decide which channel the sound from the record is to be played through by switching either input selector to phono and the other to line (to cancel out the other side). Connections on the back panel are very minimal Line 1, Line 2 and Master Out NOTE: There is no level metering at all – You’ll have to use your ears! Crossfader and Linefaders: As you would expect it’s the CF-PCV plastic fader from the 05Pro, although the cut in time does seem to be longer for some reason. 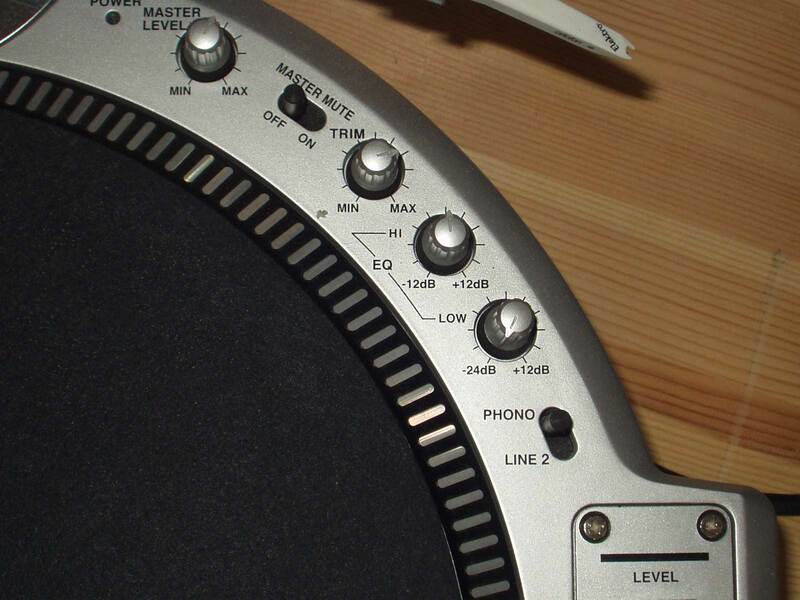 Contour control is via a 2-way switch located on the front of the unit and reverse is underneath the crossfader area. 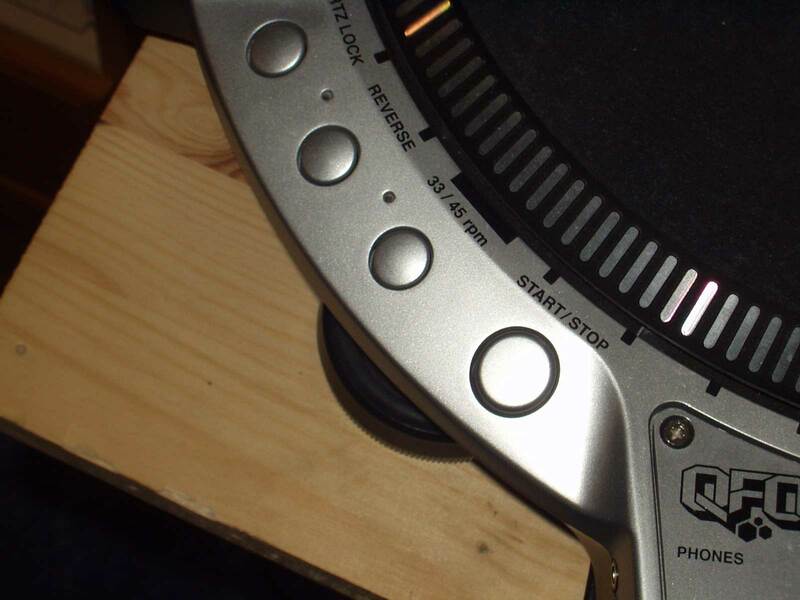 The Penny and Giles fader is available as an upgrade but you have to either send your internal faceplate to Vestax to have it modified to fit or buy a pre-modified one from them. This is also the case for the upfaders which are internally adjustable by a 3 way switch (as with the 05 and 06Pro models) with reverse switches located underneath each side. I have been informed that you can upgrade all 3 faders to P&G for about £200 including the labour to modify the 3 fader plates. This is a reversible mod in case you ever wished to put the PCV’s back in. The P&G option would have been nice as standard with proper curved controls but the standard PCV’s are lasting very well without any lube needed so far. EQ: As on the 05/06pro the QFO has been equipped with a 2-band EQ with the trim situated above. High is adjustable +12dB/-12dB and low +12dB/24dB not a total kill but just about enough. Saying that though a total kill on a 2-band EQ would mean that you would loose too much of the frequency range, I can’t help thinking that a 3-band EQ would have been nice but it’s tight for space as it is. The rotary caps have a lower profile than before being slightly shorter and tapered in for a better feel. This makes the gaps between each dial greater and thus easier to use, there is also a ridge running down the centre edge so you know what’s going on by touch rather than actually having to look at them. They now also have a black ring around the base. This seems to be just a cosmetic upgrade to bring them in line with the curvy futuristic look of the whole unit and also makes them stand out more. The QFO is an exceptional piece of kit with a high asking price. For 849 of your English Pounds you could possibly get a new PDX-2000Mk2 Pro and a Rane 56 but the point is that the QFO is portable (in its own sense!). Weighing in at only 7Kgs it’s far lighter. 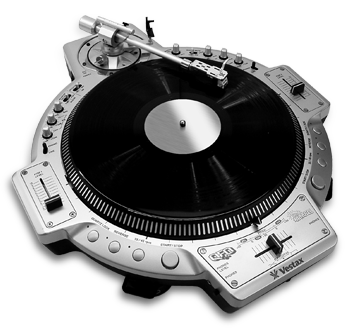 This unit appeals to dedicated skratch DJ’s more than most which, of course, is who it’s aimed at.The sound quality is very good as you would expect from a Vestax product. Unfortunately there will only be a limited run of 500 units worldwide for the foreseeable future, nowhere near enough! Pros: Overall design, Build quality, Dynamic tonearm, Super sharp motor, extremely stable platter, Motor stability and response, 180 degree pitch control, overall high quality. Cons: Price = £849 approx, Phono / line switches are plastic, X-fader plate has worn heavily in just 7 months, 2-band EQ, 2-way switched curve only (X-fader). The first thing that captures your attention is the presence that this unit has. Where ever it goes people stand and stare in amazement, It gob smacks people, it looks right, well built and thoroughly thought out.However the Crossfader faceplate on my unit has showed considerable wear in just 6 months. 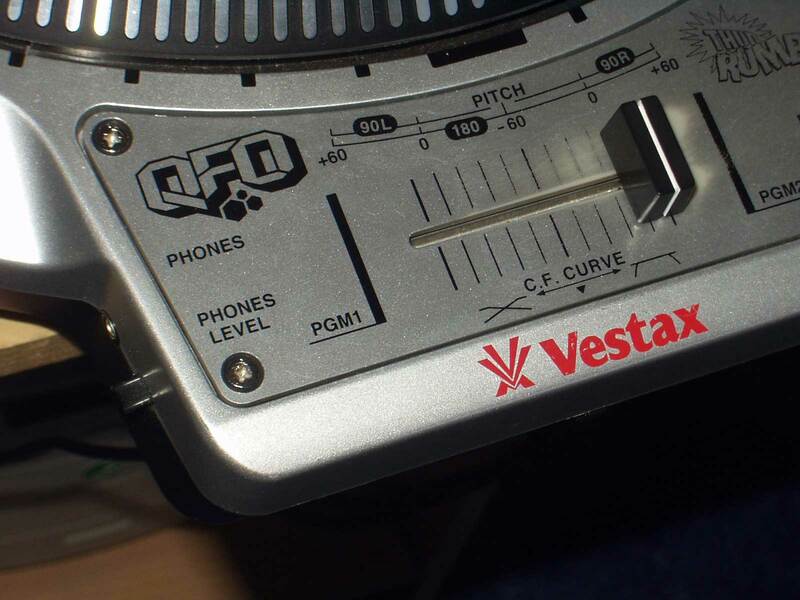 Vestax have kindly said that they will replace it free of charge if I send mine back to them but I can’t help but think that this will not happen every time it wears away.Generally though the QFO is surviving the rough and tumble of the DJ world with very few problems encountered. I have found this unit incredibly useful, convenient to use and believe it will be a welcome addition to the few people that will get the chance to own one. from Hard To Find Records for just £399!